The Idle Man started life in 2014 as a way to provide stylish clothes for men in a clothing market that never paid the male consumer much attention. Building a range of apparel for every occasion and none, The Idle Man has grown a reputation for stylish, unfussy clothes that make the wearer look and feel his best. As well as its thriving online shop, The Idle Man’s London store in Clerkenwell has become a hub for fashion conscious men who want to look good without it costing the earth. As well as its own brand, you’ll also find Levi’s, Lacoste, Calvin Klein and Schott NYC on its railings and in its pages. Its blog is a great place to pick up inspiration on clothes, music and so much more. For a bespoke selection, you can even get free personal styling tips, ideal for those in need of an outside eye. With a certified ‘Great’ Trustpilot score, you can shop with confidence with The Idle Man. How do I use my The Idle Man discount code? Can I get a student discount at The Idle Man? You bet! Register here and get 10% off when you shop online. Can I get free delivery with The Idle Man? You can indeed when you spend £50 or more. Where is The Idle Man store? Next Day - £5.95 - Must be ordered by 5pm. You can return an item within 28 days of purchase for a refund or exchange. After 28 days a refund can only be made through store credit or a change of size. It’s not always easy to find good quality men’s fashion that doesn’t cost the earth, but head on over to The Idle Man to discover a huge range of men’s clothes at great prices. Upgrade your wardrobe for less with a The Idle Man discount code and you could save yourself some money on your next basket. 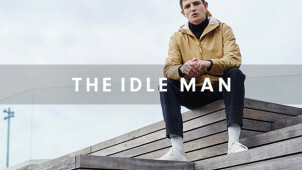 With your favourite fashion names alongside its own The Idle Man stock, it's really got something for everyone. We all know blokes can be indecisive when it comes to matters of fashion, so why not sign up for free personalised fashion tips from The Idle Man team? Simply complete a quick survey about your preferences and head stylist and store manager Alfie will build an outfit especially for you. Then you can choose what you like and discard what you don’t - there’s no obligation and it’s completely free! For the fashion-forward man who doesn’t want to break the bank, we’d recommend checking out The Idle Man’s own-name label. From casualwear to office attire and seasonal clothing, The Idle Man’s range is full of quality staples and key pieces to form the core of every man’s wardrobe. A The Idle Man promo code from vouchercloud could save you money off your next order, so you can look and feel great for less.